Funky, bluesy, rockin', with a couple of tracks which touch on jazz. But that does not mean that, although the Capital B debut first album CD collection entitled ‘Staccato Grove’ is a collector’s item, that it’s entirely unavailable to the public. 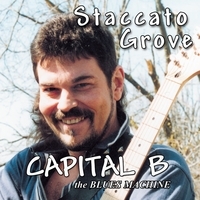 Because of demand and because of Capital B’s ever-growing popularity, he has authorized CD BABY to distribute the entire debut first album, ‘Staccato Grove’ as a digital download. “You can download all of the tunes or only the ones that ‘tickle-you’.”, says the songwriter/performer. “unlike many other artists, concerning their first recorded efforts, I’m personally still very proud and I still like to listen to my first CD Staccato Grove. And by the way it’s GROVE not groove (despite the album’s ‘grooves’ being solid, varied, very individual and pronounced. )”, says Capital B. “My home-town Ottawa, Canada’s national capital was, at one time years ago, the home-base of a band called the ‘Staccatos’. It was acknowledged by most that they were one of the top musical groups in Canada and certainly the best band in Ottawa back then was the ‘Staccatos’. They were contemporaries of another internationally well known Canadian band, ‘The Guess Who’, (The Guess Who’s biggest hits back then were, Shakin’All Over, These Eyes, American Woman and more). ‘The Staccatos’, who not long after changed their name to the ‘Five-man-Electrical Band’ were ultimately the authors and performers of at least a couple of ‘rock-anthems’. Rock-anthems which many mistake for the early ‘Eagles’. Capital B says, “For me the ‘Five-man-Electrical Band’s’, (‘Staccatos), recording of ‘Absolutely Right’ & ‘Signs’ …...you know, ‘Signs, signs, everywhere a sign, blockin’ out the scenery ‘n messin’ my mind. Do this, Don’t do that. Can’t-cha read the signs?”, Those lyrics..wow. Those are rock-anthems and social commentary too. I guess I always wanted to write one. A creative writing teacher will instruct and encourage students to, “write about what you know”. That is what Capital B did, has done and continues to do throughout his current 14 year career. (That’s since he came back to professional music after a twenty-year absence). Busy Life: Well …instead of ‘offing’ one-self, perhaps it’s better to remain busy by writing a song. My lead solo is carefully composed to be different and to go through a beginning, middle, & an ending. (The solo… It’s purposely & purposefully brash, angry…staccato like a horn-line fanfare and ‘busy’ like the current schedule most of us face daily). I personally enjoy the “little feat” feel. What do you think? Devil in her Soul: I wanted to write a Rumba! Vocals are a little raw, I was still smokin & drinkin’ back then. My ex girlfriend’s teenage son heard the song prior to meeting me, and when he found out his mother was about to go out on a date with me he asked her if she was really going to date a black –man? I’m on fire: A really funky rocker ..again my lead solo is carefully composed to be, different and unorthodox and to go through a beginning , a middle & an end. (it’s ironic how (a personal) “passion goes ‘out of fashion” according to my lyrics). Where’s my baby been? : Traditional Chicago Blues It tells one of my stories. It’s about the possible pitfalls involved with being in a serious relationship with a,‘ significantly younger woman’. Flirtin’: Light ‘n Jazzy. Perhaps too cute? The Scars you left me: Traditional Chicago Blues. It tells one of my stories. Others can seem to relate to it too. Its message: That your bound to keep repeating the same mistakes until you study and learn life’s lessons. I keep comin’ back: A provocative opening lyric which gets attention & gets their heads up at a live show. (It’s a) Strange, Strange World: A very personal statement. Wrought from a confused childhood filled with a lot of ‘mixed-messages’(I’m still proud of my composed and controlled soul searing guitar solo in the back round) Great piano too. It’s science fiction cause the premise of the lyrics is that a woman will actually sit down and listen to the reasons why you list for breaking-up with her, (Yuk, Yuk, Yuk). I like the way the lyric of the chorus wraps up the whole CD , I structured it that way. “It’s over, I’m done, I’m out’ta here, I gotta move on!” I thought it was a great way to end the CD.